Easy Sausage, Hashbrowns and Egg Casserole is the perfect dish to prepare if you want a good breakfast, and a great dish to share with family or friends. We recently had friends staying with us from out of town. They had so graciously hosted us earlier in the year, that I wanted to make sure they had a great relaxing time with us. 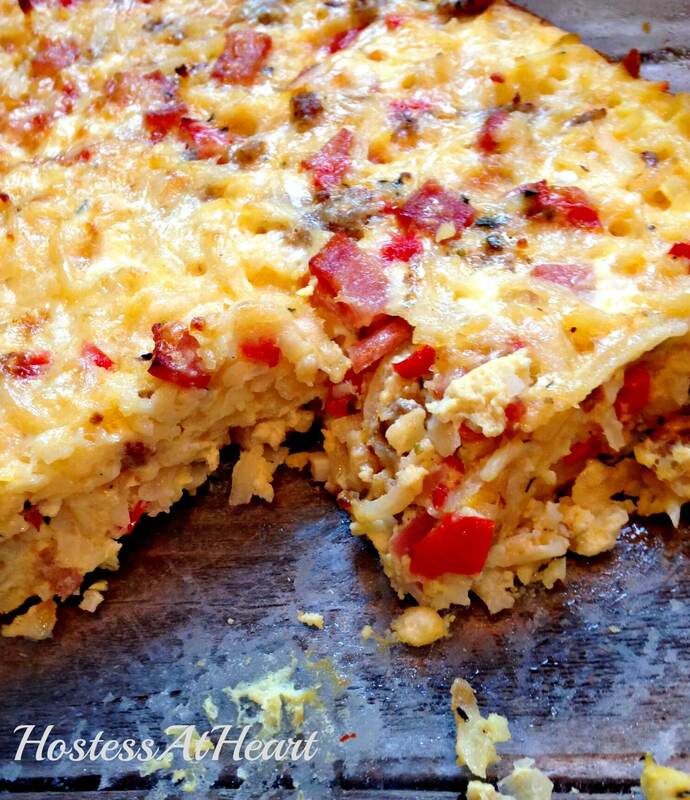 Easy Sausage, Hashbrowns and Egg casserole for breakfast it easy to do. I wanted to make sure that I had as much done in advance as far as plans and meals go. I don’t enjoy visiting someone that is working so hard that we don’t get to visit. John and I are no-fuss people, and love to help with meal preparation and clean-up. We don’t want our hosts going out of their way for us. Before our friends got there, I made a simple breakfast casserole and put it in the refrigerator to bake the next morning. I also made some Glazed Apple Crumb muffins (eyes rolling into the back of my head delicious), and made sure I had a selection of yogurt and fruit available. It turned out that this casserole fed us two mornings in a row. The second morning, I heated it up in the microwave, and it was just as delicious the second time around. It is a very versatile dish. You can add more veggies or change the meat or cheese selections. With the Holidays on our horizon, this is a great dish to prepare if you want a good breakfast to stave off the out of control eating later in the day or just a great dish to share with family or friends. 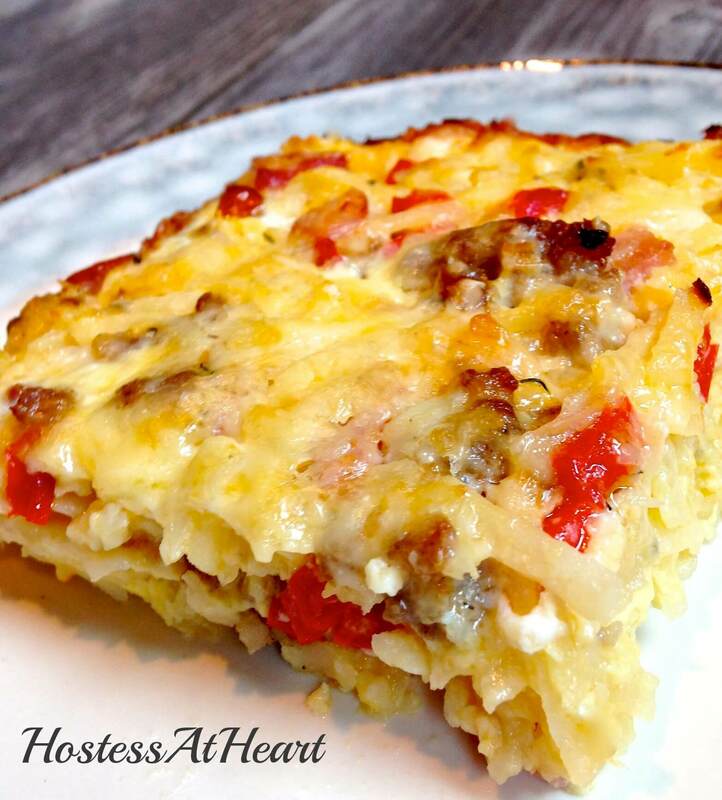 Easy Sausage, Hashbrowns and Egg Casserole the perfect dish to prepare if you want a good breakfast, and a great dish to share with family or friends. Preheat the oven to 375 degrees F. Spray a 9 x 13 inch baking dish with non-stick cooking spray. Brown sausage over a medium-high heat. Remove meat to a large bowl. Discard all but 1 tablespoon grease. Add the onion and red pepper to the pan and saute for 5 minutes or until cooked. Add the garlic and saute for an additional 2 minutes. Pour the vegetable mixture into the mixing bowl with the sausage and add diced canadian bacon, hashbrowns and 1-1/2 cups of cheese. Stir to combine. In a separate bowl, whisk eggs, milk, salt and pepper together. Add to hashbrown mixture and stir to combine. Pour into the baking dish, and top with remaining 1/2 cup of cheese. Cover with aluminum foil and bake for 20 minutes. Remove foil and bake for an additional 10-15 minutes or until the casserole has started to brown. Remove from the oven and allow to rest for 5 minutes. Top with green onions if desired. Did u mean 16oz of sausage instead of 6? It is actually 6 oz of sausage. You can use 9 oz total if you don’t use any other kind of meat. I corrected the recipe Kameil. Thank you for visiting! I love this hash brown casserole, Julie, and used to make it all the time. Except mine doesn’t have peppers or Canadian bacon. Why didn’t I think of adding them? They make the casserole so festive-looking. Haven’t made it in a long time. Not sure why. It’s time, I think. Thanks Judi! It worked our really well. I like doing these dishes around the holidays when we have a big dinner planned. Holds those tummies over.